Lake Superior is changing rapidly, and in big ways. This week scientists from the University of Minnesota Duluth are trying to figure out why the lake is warming, why surface ice cover is declining, and why biological diversity is decreasing to the point where there's less food for fish. 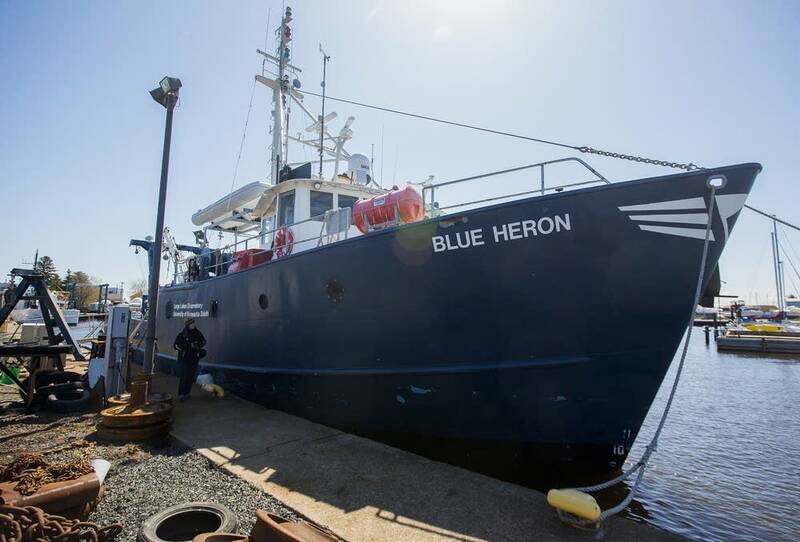 They're crisscrossing the western side of the lake aboard an old fishing trawler — an 90-foot vessel called "Blue Heron" that's been retrofitted for research — analyzing plankton and water chemistry. Superior is 5 degrees warmer than it was 30 years ago. The amount of surface ice is down a whopping 80 percent. 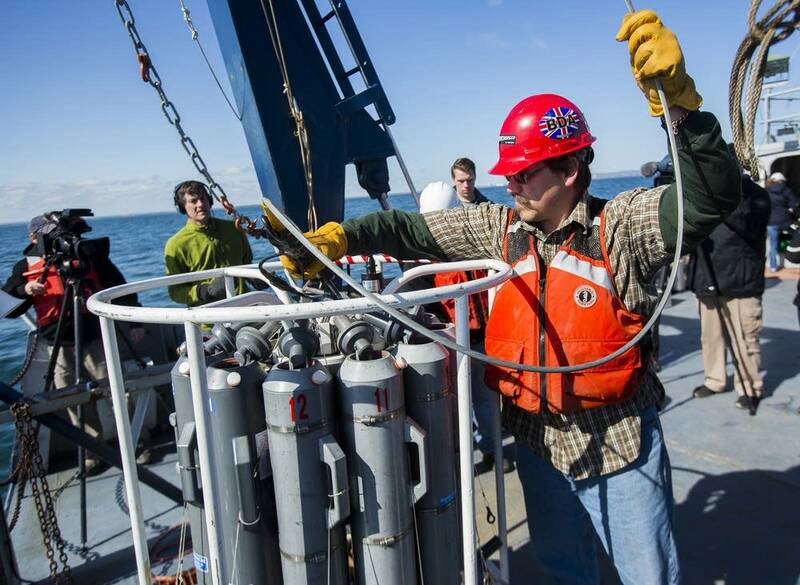 To understand how those changes are affecting one of the world's most important bodies of water (it holds about 10 percent of the planet's fresh water), the UMD researchers set out Monday to take their first set of measurements this year. They're collecting water samples at different depths by dipping cylinders that hold a ring of bottles into the lake. 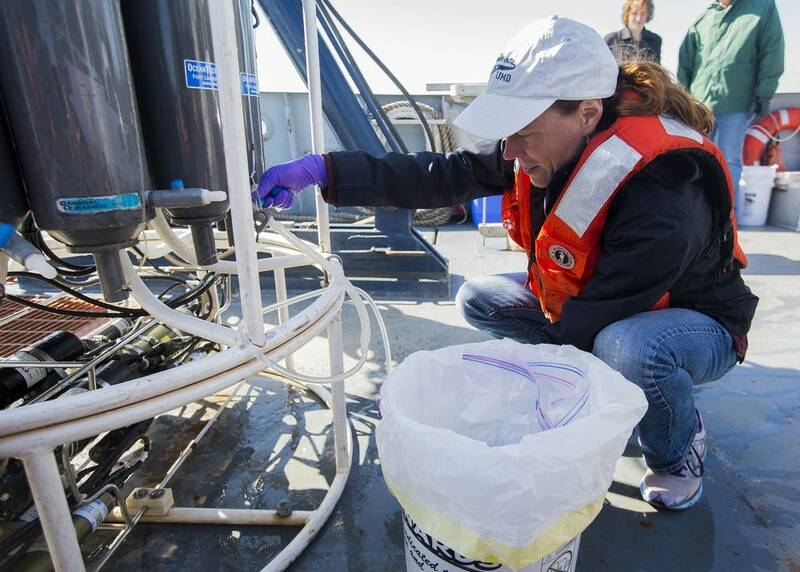 "We're sampling physics, chemistry, biology all on the same stations and at the same time," said project leader Liz Minor of UMD's Large Lakes Observatory. "What we're trying to do is get a picture of how they interweave." Every summer, the water in Lake Superior stratifies. The water near the surface warms up and becomes less dense. That forms a warm layer above the colder water underneath. Minor says how the water moves and stratifies affects the availability of nutrients and light for everything in the lake's food chain, all the way down to microscopic phytoplankton. "We know the lake's been warming up, and we know nitrate levels have been increasing, and we think phosphorus levels are decreasing," Minor said. "And we have some snapshot pictures of that from the past, but we don't have a good baseline of all the data." Minor hopes to develop a comprehensive picture of how the lake is functioning "for people 20 years from now who want to look at how the lake is changing." The data could be especially useful in understanding the effects of climate change. Large Lakes Observatory Director Bob Sterner says that's because Superior, compared to most other large lakes, is still relatively pristine. "It's getting kicked around in fewer ways than some of the other systems are, so we have this vast, very physically-driven lake, where what's happening in the lake waters, what's happening to the organisms, is very much dependent on the physics, and the physics is determined by climate," he said. Sterner and his colleagues will make additional voyages in July, August and October.